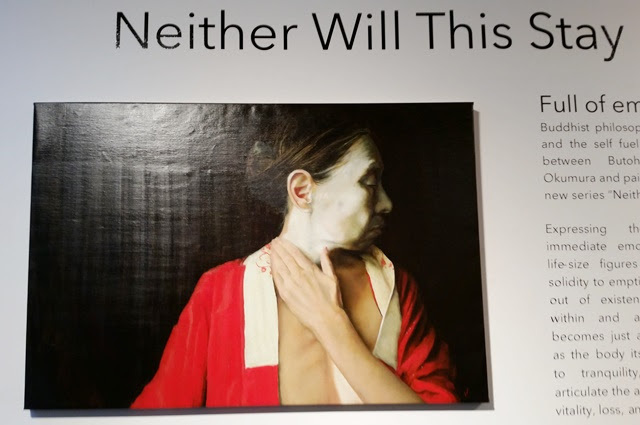 Core Gallery in Seattle is currently exhibiting "Neither Will This Stay" by Ruthie V. in collaboration with Butoh artist Kaoru Okumura. 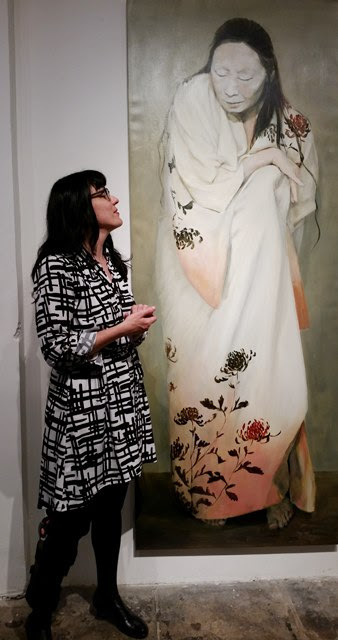 The Opening Reception was held on Thursday, July 7th with the artist and model in attendance. This series of beautifully layered, larger-than-life figurative works express Buddhist philosophies of impermanence, emptiness, and the self. 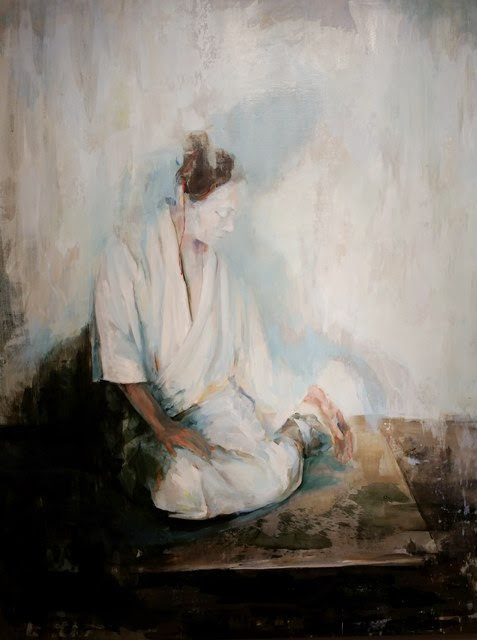 Ruthie V. is a Seattle-based fine artist and art instructor. She uses a minimalist approach to create more with less, and generally presents a new show annually with a completely different theme and style. 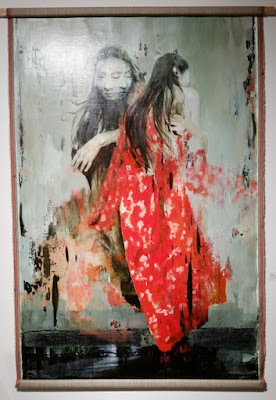 Though she usually moves on to a new theme at the end of a show, she has been inspired to continue creating art under the theme of "Neither Will This Stay". Ruthie currently leads workshops and will soon be offering art classes through the Seattle Artist League. 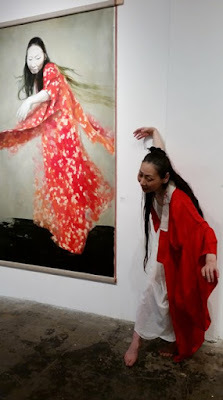 Kaoru Okumura is a Seattle-based Butoh artist, photographer, and video artist. She studied with Asbestos-Kan in Tokyo and performs regularly as a solo artist as well as with groups like Daipan Butoh. Kaoru performed throughout the Opening Reception, engaging the audience and drawing in spectators from outside as they were passing by for the First Thursday Art Walk. My favorite piece, below, perfectly embodies the theme of impermanence while also capturing the meditative stillness I associate with tea ceremony. "Neither Will This Stay" will run through July 30th. 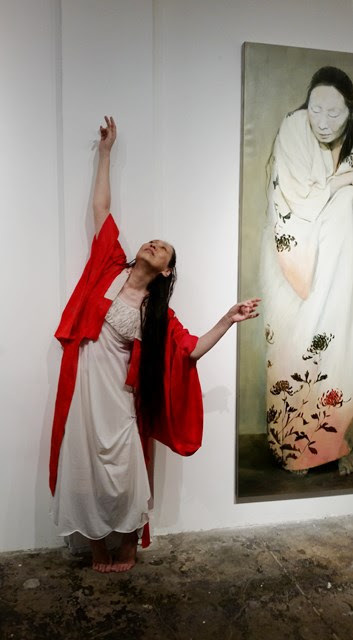 There will be an Artist Talk with a short Butoh performance by Kaoru on July 14th at 7pm and a Talk for Painters on July 22nd at 7pm.